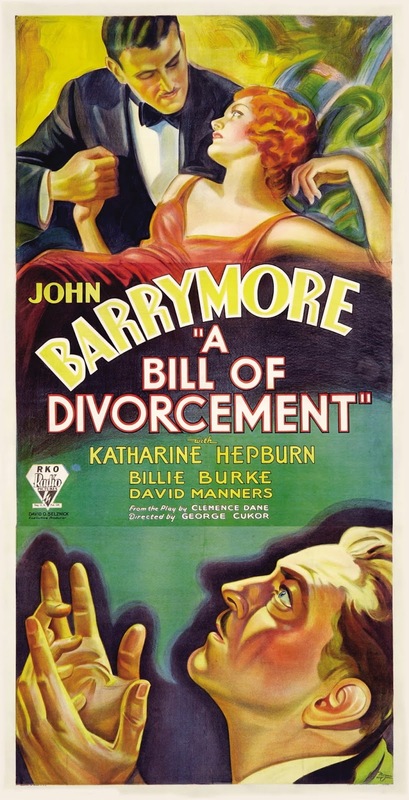 The great Katharine Hepburn began her illustrious career with A Bill of Divorcement (1932). She plays the daughter of a man (John Barrymore) who returns to his family after being institutionalized for several years. No actor in the annals of old Hollywood history had a career quite like Katharine Hepburn. This daughter of a Connecticut doctor and his suffragette wife won four Academy Awards in a career that spanned six decades and became a feminist icon for her outspoken self reliance. 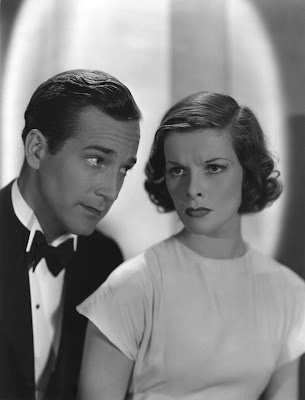 Because Hepburn's career is so significant in film history, I'm going to write an article about each one of her films starting with her first movie, the melodrama A Bill of Divorcement (1932). Hepburn became an instant star with her touching portrayal of a beautiful woman who gives up her promising future to care for her mentally ill father. Hepburn's costars: John Barrymore, Billie Burke, David Manners, and Elizabeth Patterson. Awards: One of the National Board of Review's top 10 films of 1932 (click here for the full list). Source Material: Clemence Dane's 1920 play that deals with a British law that allowed wives to divorce their husbands if they were declared "incurably insane." The Plot: Meg Fairfield (Burke) and her daughter, Sydney (Hepburn), are celebrating Christmas when Sydney's father, Hilary (Barrymore), who has spent the last 20 years in a mental institution, unexpectedly arrives. Hilary believes he has recovered from his mental illness and can return to his life with his family, but he is shocked to learn that Meg divorced him during his hospitalization and now plans to marry another man (Paul Cavanagh). David Manners and Katharine Hepburn in a publicity still for A Bill of Divorcement (1932). Background: Dane's play had already been made into a 1922 silent film when RKO Pictures producer David O. Selznick decided to dust off the script for a sound remake. The box office-minded Selznick wanted MGM star Norma Shearer for the lead, but director George Cukor was taken with Hepburn, who had recently made a screen test for the studio. Hepburn was coming off of the hit Broadway play The Warrior's Husband (she played the athletic queen of the Amazons), and there was something about Hepburn's forthright demeanor and angular beauty that Cukor felt would be fascinating to movie audiences. Reception: Cukor's instincts proved correct. A Bill of Divorcement was a sizable hit, and Hepburn became an instant star, although part of her media attention focused on her unconventional habits like her penchant for wearing overalls everywhere she went. Hepburn's performance: Kate isn't quite the force of nature she became in later movies, but her performance still stands out among a very talented cast. She's much more natural than the rest of the cast, who declaim their lines in stagey English accents (Burke rolls her R's with particular distinction), or, as in Barrymore's case, chew the scenery with abandon. Hepburn is also just plain fascinating to watch with her sleek pre-code fashions and idiosyncratic mannerisms. Moment to Watch For: Hepburn floats down a staircase in an elegant gown. It's a great "star is born" moment in her first scene in A Bill of Divorcement (gif below). Katharine Hepburn's first scene in A Bill of Divorcement (1932). Significance in Hepburn's career: A Bill of Divorcement instantly made Hepburn one of the hottest properties in old Hollywood and earned her a seven-year contract with RKO. It was also the first of 10 films she made with Cukor. The Bottom Line: A Bill of Divorcement gets bogged down in turgid melodrama and outdated attitudes about mental illness, but it's still a fascinating film that showcases Hepburn's star power in embryonic form. Also, if you like to watch Barrymore ham it up (raises hand), this is the film for you. Availability: This is actually quite hard to find, although it is on YouTube. Other versions: A British silent film with Constance Binney in the Hepburn role. There's also a 1940 remake with Maureen O'Hara and Adolphe Menjou.